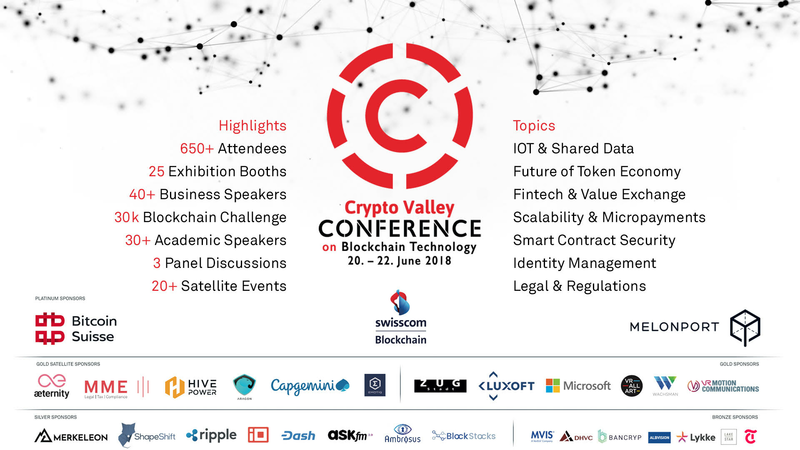 The purpose of the Crypto Valley Conference on Blockchain Technology 2018 is to bring together leading researchers, entrepreneurs, startups and established companies from all over the world to share and discuss state of the art advances and developments in the Blockchain Technology ecosystem. The venue holds a maximum of 650 attendees. Be sure to order your ticket early to guarantee your place. Crypto Valley Members will still be able to benefit from the Early Bird Discount of CHF200 after 31st March 2018, while ticket availability lasts. Members should login and the discount will be automatically applied. IEEE Members will still be able to benefit from the Early Bird Discount of CHF200 after 31st March 2018, while ticket availability lasts. IEEE Members should pay the full ticket price and then they will receive CHF200 in cash at the event. Discount codes cannot be combined. There is a limit of one ticket per order. If you have multiple coupon codes as a sponsor, each ticket order must be made with a different email address.